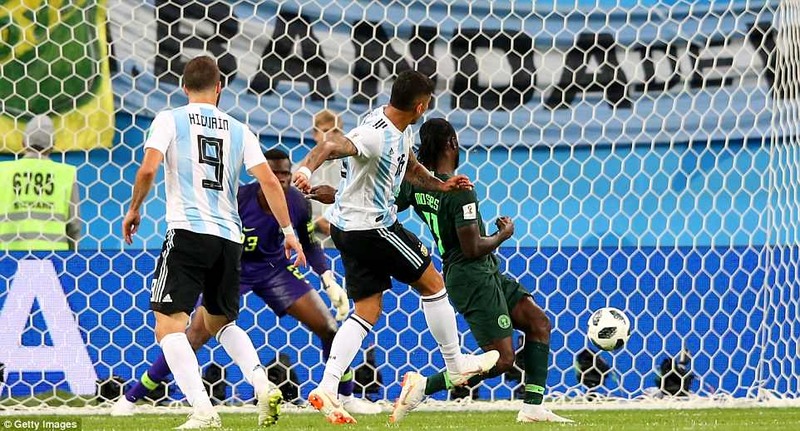 NIGERIA 1-2 ARGENTINA: Ultimately, it was a fabulous volley from Manchester United’s Marcos Rojo that propelled Argentina into the final 16, but this was about him. Save Messi. That is what the neutrals prayed for. With France up next it may only delay his departure by days, not weeks, but for now, he remains. The ball, delightful from Ever Banega, arrived over his shoulder, on the run. Lionel Messi watched it onto his left thigh, killed it there, let it drop to his left boot, took a perfect controlling touch and switched it, right. Kenneth Omeruo, whose job it was to in some way harness the wind, knew he was in trouble. In these moments, it is as if Messi has a way of rendering opponents powerless. 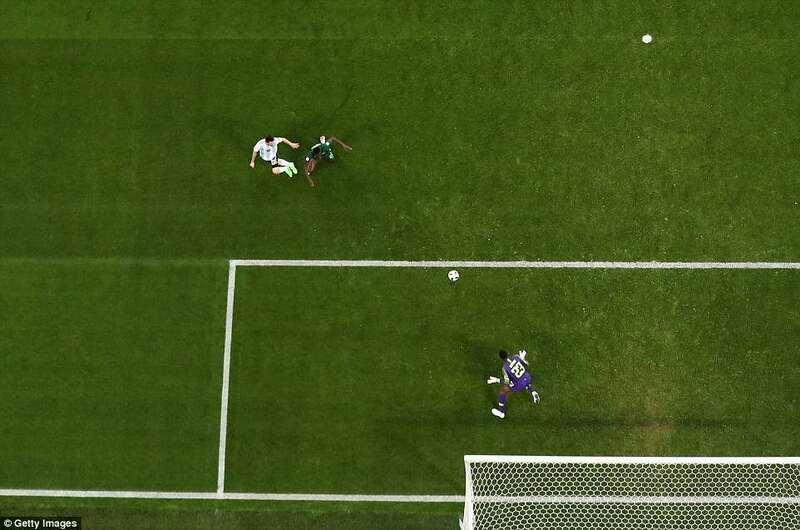 He shot, across goalkeeper Francis Uzoho, and the ball moved obediently into the far corner of Nigeria’s net. So that’s what you would have been missing. That’s what would have disappeared from this World Cup. Sunshine. Magic. Wonder. 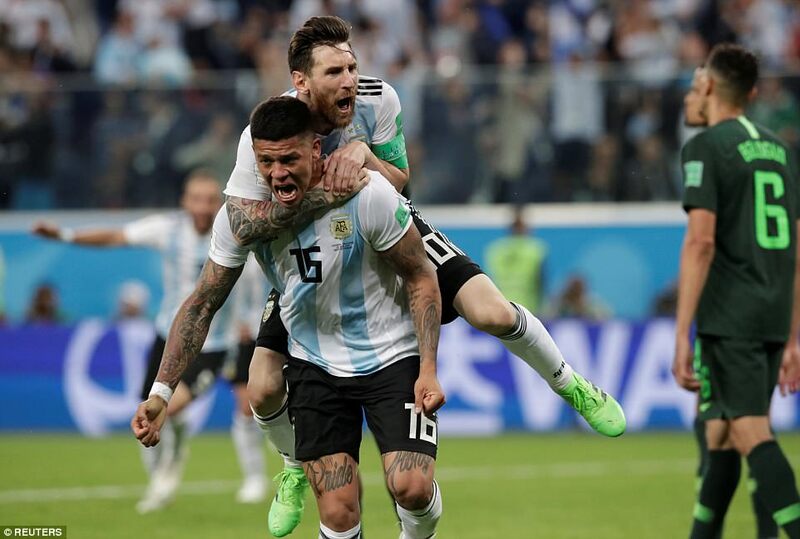 Ultimately, it was a fabulous volley from Manchester United’s Marcos Rojo that propelled Argentina into the final 16, but this was about him. Save Messi. That is what the neutrals prayed for. Uzoho 6; Balogun 6, Ekong 6.5, Omeruo 7 (Iwobi 90), Idowu 6.5; Moses 8, Etebo 6, Mikel 7.5, Omeruo 6.5; Iheanacho 6, Musa (Nwanko 90+1). With France up next it may only delay his departure by days, not weeks, but for now, he remains. We will watch again on Saturday, tune in to see if one man can inspire a nation again. The stadium was overwhelmed by Argentina’s travelling support, but the cheers were not just from them. It would take a heart of stone not to smile at the knowledge that Messi endures. This might have been his last World Cup, without Rojo’s goal. There would have been a reckoning in Argentina after this, with speculation Messi was going to be among several senior players in an aging team to withdraw from international football. Yet even if this goal, this performance, had been his farewell, it was one that summed up why this prize has remained so elusive throughout his career. 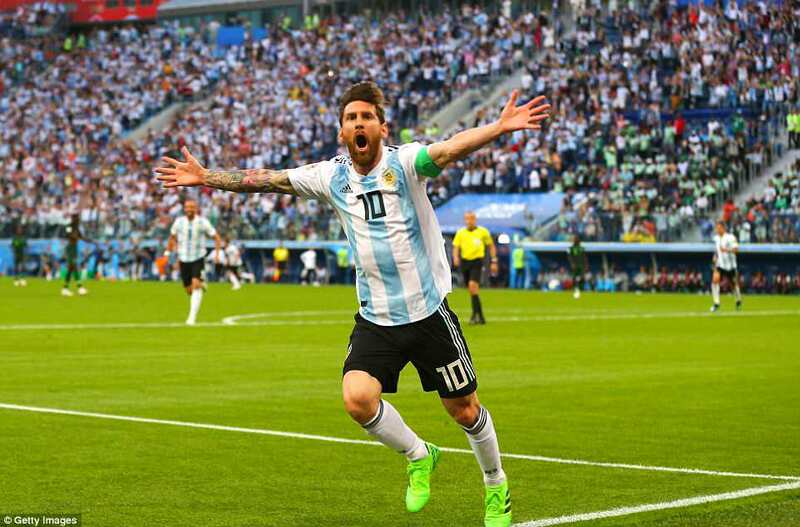 In the end, Messi almost wasn’t enough to drag Argentina out of their malaise. 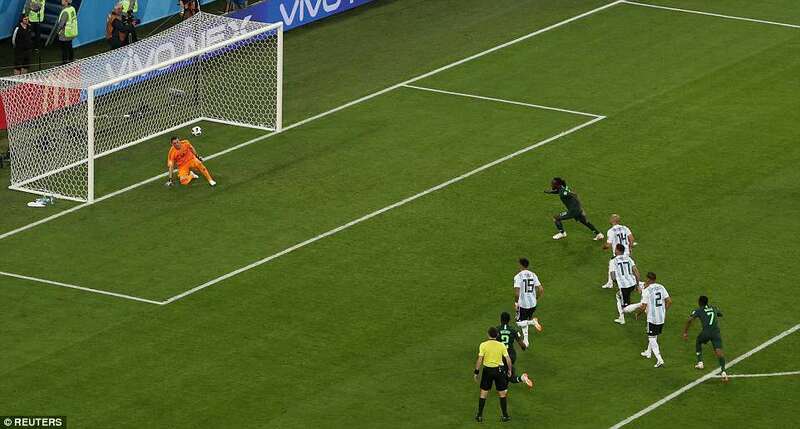 A Victor Moses penalty confirmed had drawn Nigeria level and had Cuneyt Cakir, the referee, been consistent with the call given against Portugal on Monday night, Argentina would have been gone. Rojo headed the ball onto his arm, much as Cedric had done 24 hours earlier, but after consulting the VAR, Cakir ruled no penalty. It was the right call – Rojo couldn’t get out of the way and there was no intention to handle – but not a consistent one. The same could be said of Cedric, too. 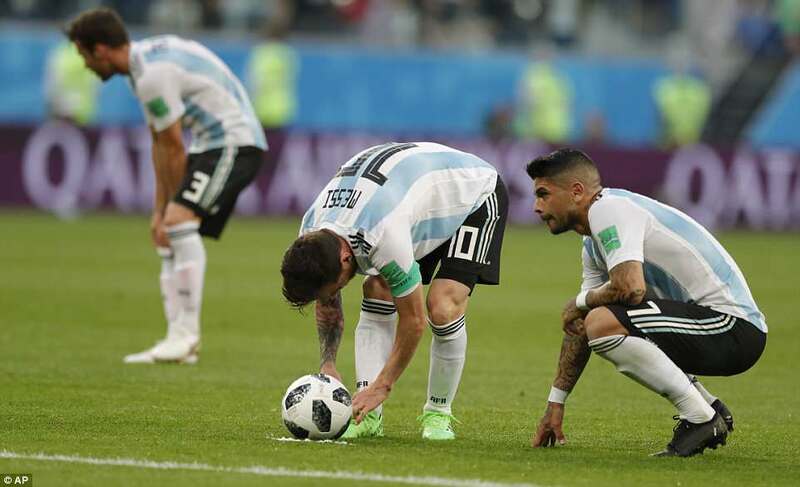 Argentina had started so well but as the and the competition ebbed away from them grew increasingly desperate and haphazard. They were on the brink, no doubt of that. And then: salvation. Cristian Pavon crossed from the right and Rojo simply met it with all he had. He could have taken a touch, could have finessed. He didn’t. 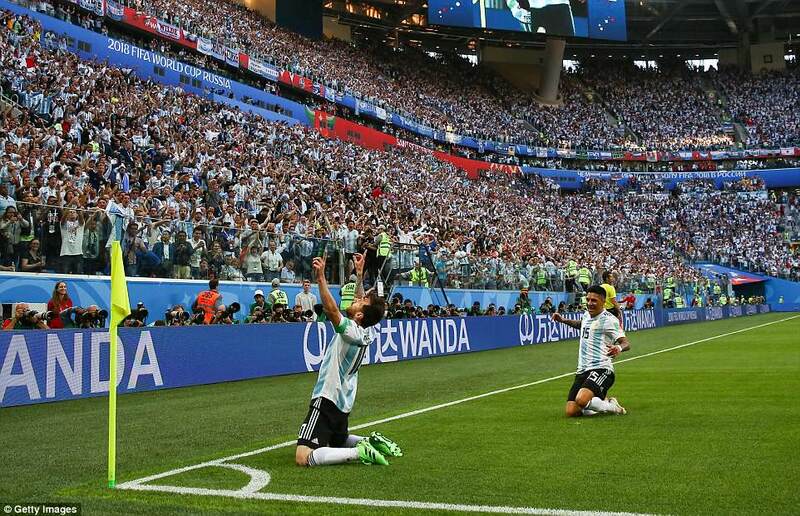 He seized the moment, seized the day, seized a place in the second round for Argentina. Messi has much to thank him for; but so do we. There were times in the first-half, and plenty of them, when it seemed unfathomable that Argentina had got themselves into this state. Their supporters must have been wondering it, in idle moments when they were not cheering and singing ferociously for their team, maybe the players, too. Argentina are far from the strongest defensively, but in attack, focused and firing, they are sublime. The changes helped. Sergio Aguero may have been made a scapegoat for a team that was flawed on many levels, but the introduction of Gonzalo Higuain, and in particular Sevilla’s midfielder Ever Banega changed this team. 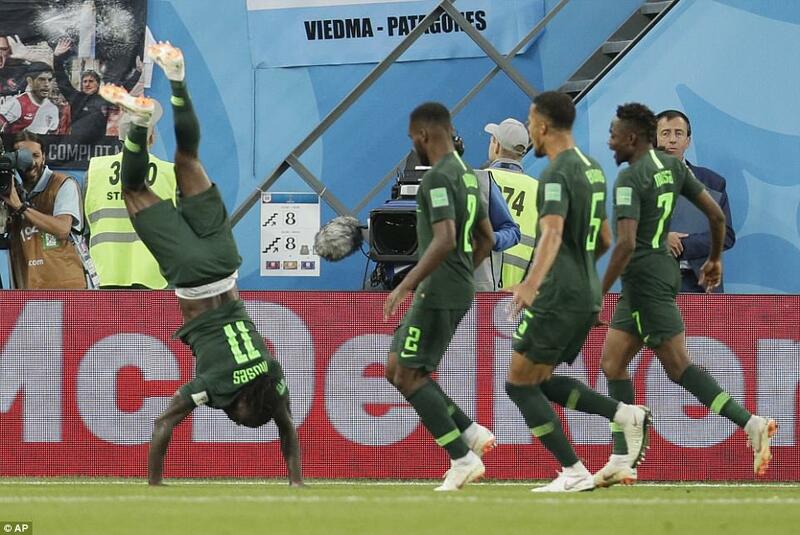 The switch to a back four was also important, although the fact that one of Nigeria’s rare shots shortly before half time went out for a throw-in tells its own story. Argentina could have been done by half-time, in fact. As well as Lionel Messi’s goal, the little genius hit a post and played an exquisite ball through for Higuain that should have amounted to more. Angel Di Maria was also clear until cynically felled by Leon Balogun, coming to Brighton from Mainz in time for next season. 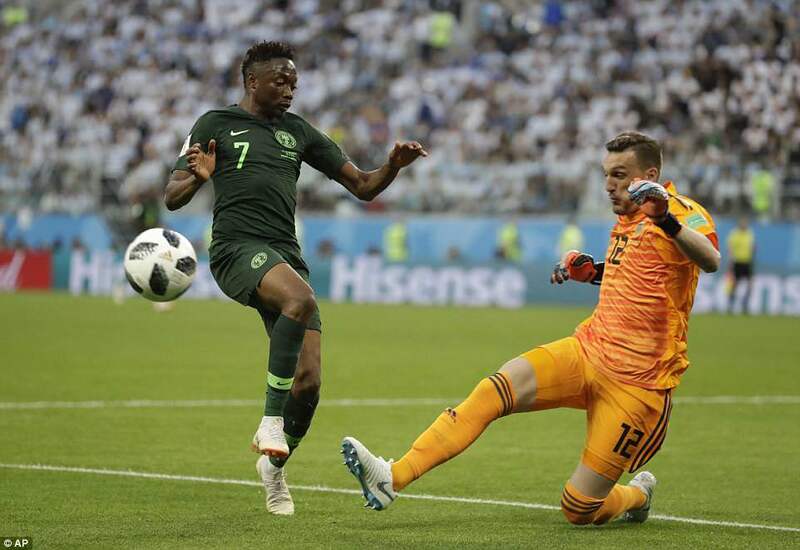 Only the presence of goalkeeper Francis Uzoho stopped it ending with a red card. 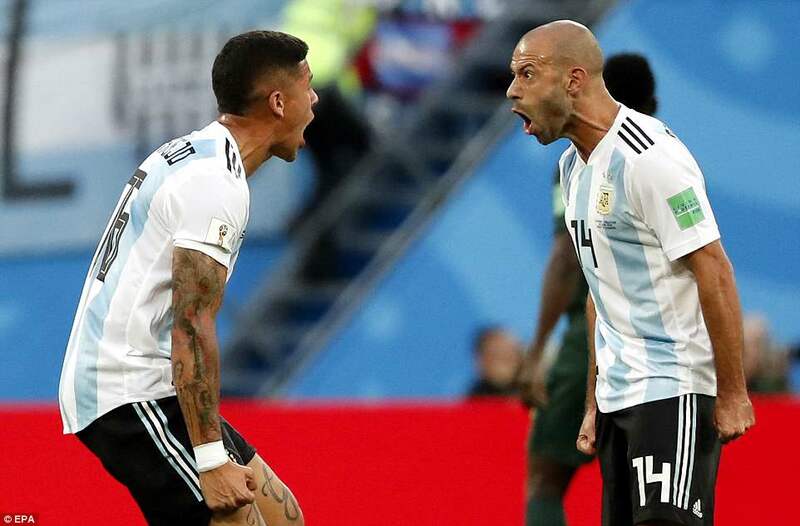 Argentina’s World Cup – from the ill-conceived preparation match in politically-charged Jerusalem, they had to be cancelled at short notice – to the obvious tensions around coach Jorge Sampaoli behind the scenes, has been chaotic even by their standards. It was said that the team for this last roll of the dice in Group D had been selected by the players, not the coach – although some players are more equal than others, one imagines – but if so they did a decent job. 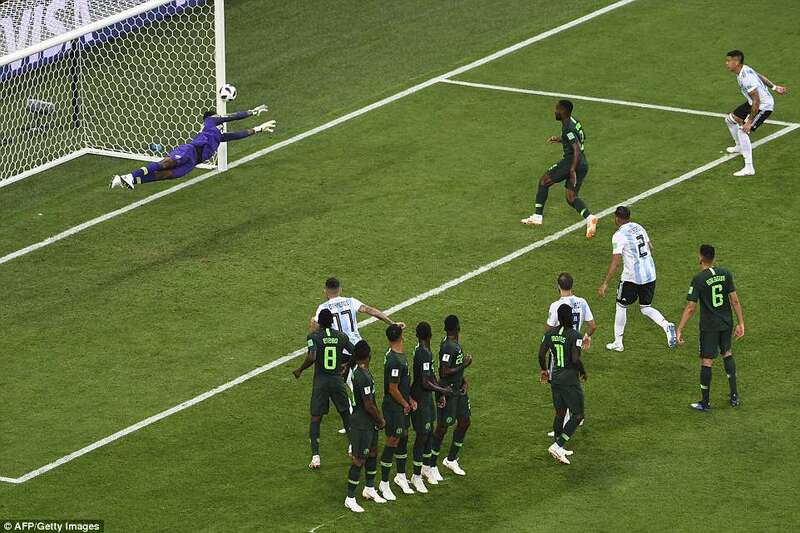 This was a more balanced, secure Argentina side, starting in goal where Willy Caballero had been jettisoned for Franco Armani, a 31-year-old from River Plate, on his international debut. He had very little to do but his handling was secure in the first-half even if his kicking was wayward. Not more so than Cabellero mind you, who gifted Croatia their first goal in a traumatic 3-0 win, and then failed to recover. That has been Argentina’s problem at this tournament. Setbacks have had a debilitating effect. Messi missed a penalty against Iceland and it has taken him more than a week to shrug it off; Cabellero was poor for Croatia’s first goal, and then ineffectual for another two. Big players have shirked responsibility at important times, gone quiet, gone to sleep. 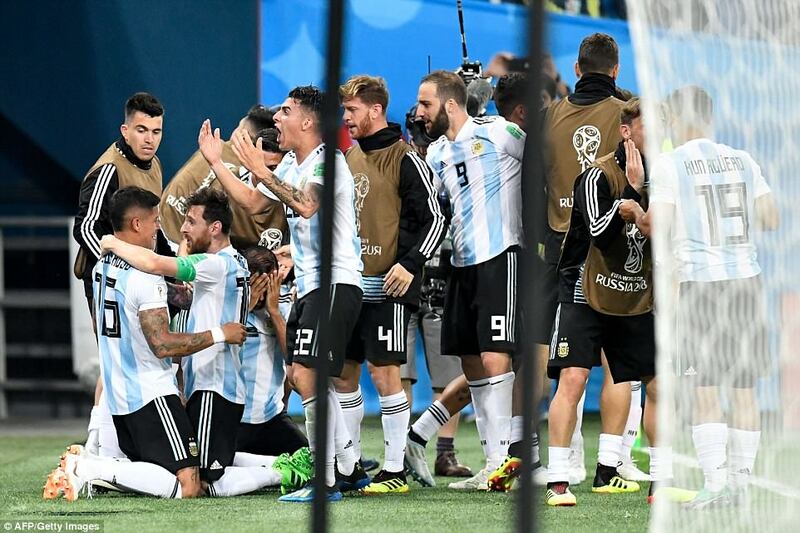 It took this, the very real possibility that their World Cup would be over at the group stage, for the real Argentina to show itself. When they did, Nigeria couldn’t live with them. 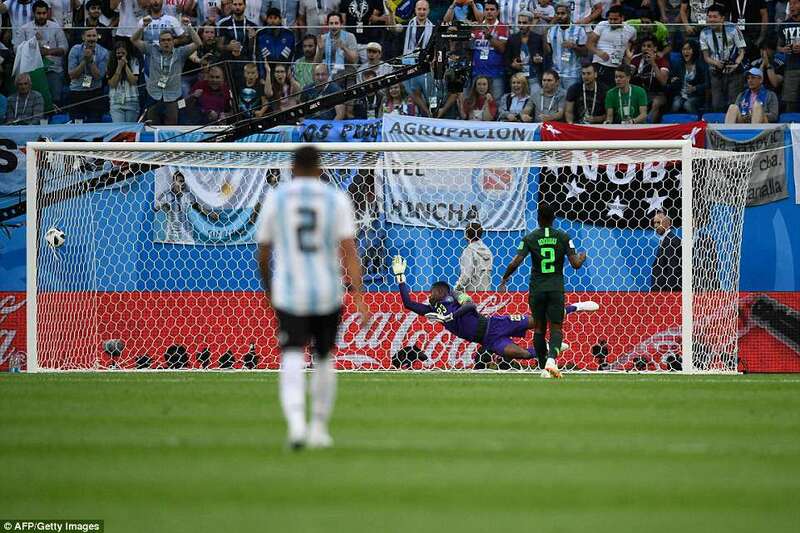 Ahmed Musa had an early effort that floated comfortably over after eight minutes, but after that it was all Argentina. Kelechi Iheanacho could not get into the game at all, and was replaced by Odion Ighalo, late of Watford, at half-time. 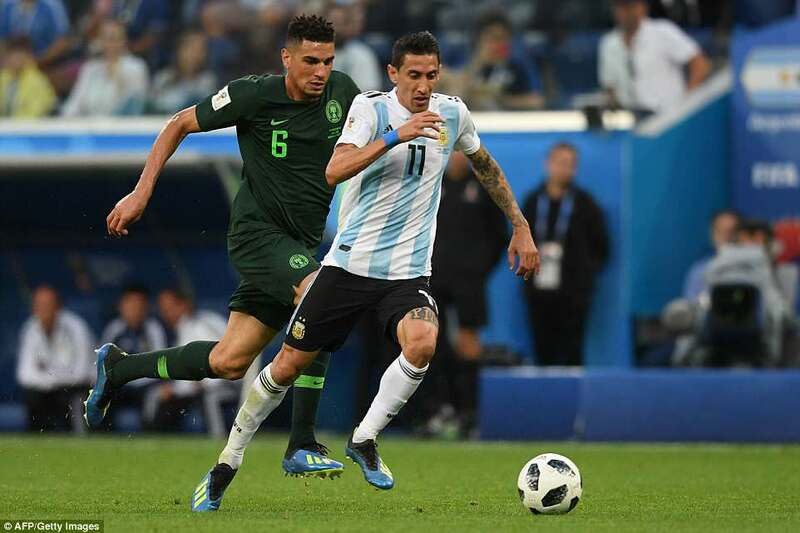 Argentina could have been three goals up by then – and the way this group was poised that would have made the second-half considerably less tense – had they taken their chances and caught the breaks. 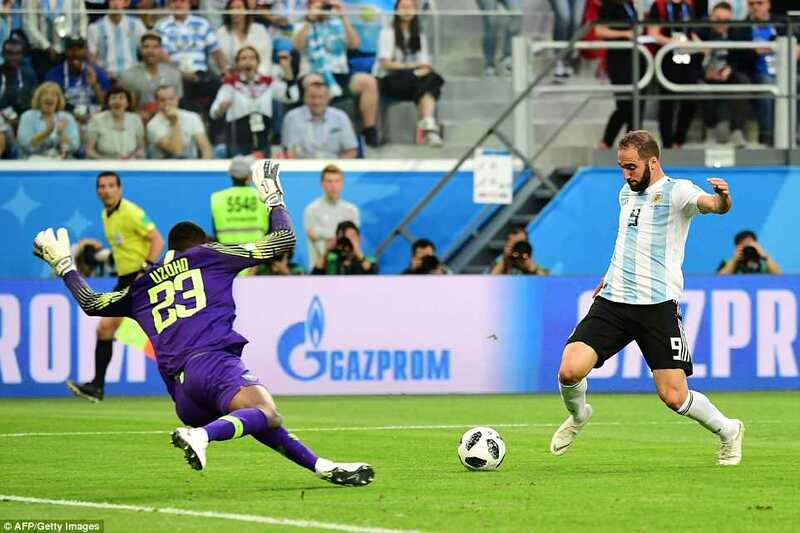 In the 28th minute, a beautiful, perfectly-weighted through pass by Messi, found Higuain who outstripped his marker but was thwarted by teenager Uzoho in goal, the young man bravely off his line, saving at his feet and catching a painful blow, knee to head, in the process. Fortunately, he was able to carry on. In the 32nd minute, a long ball from the back set Di Maria away until Balogun gave up chasing and took up tripping instead. 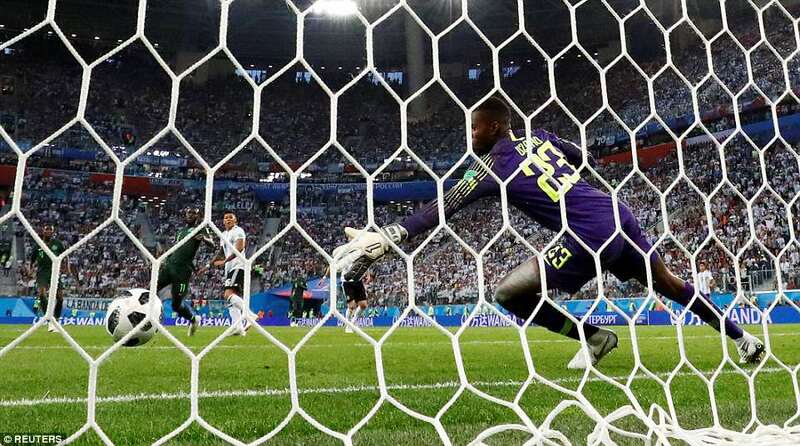 Had Uzoho not been at home he might have gone, instead referee Cuneyt Cakir produced only a yellow card and from the resulting free-kick Messi flighted the ball over the wall and Uzoho got the merest touch to push it onto the far post. 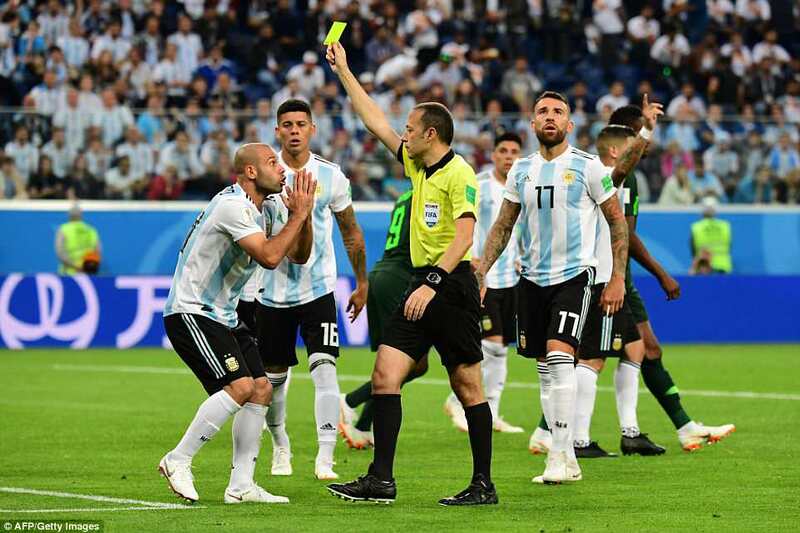 Argentina were playing well, full of confidence, but defensive frailties and the determination of referees to at last address man-handling in the area conspired against them. 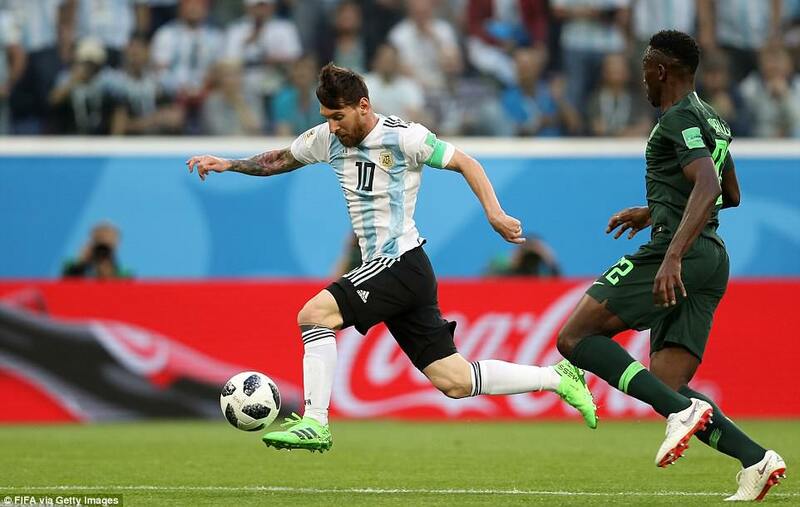 Javier Mascherano – past his best and no longer a player Roy Hodgson considered more influential than Messi when distributing his Ballon D’Or votes – had several goes at Balogun as a corner came in, before dragging him to the floor. Cakir pointed to the spot, the usual mimes of protests resulted, replays showed the right call had been made. Victor Moses stepped up, took two paces and hit a gentle one, only slightly to the right. Luckily for him, Armani had gone the wrong way. 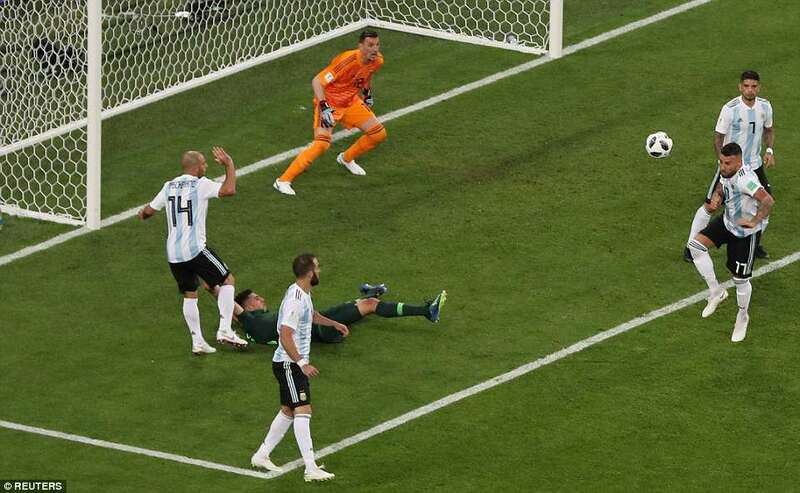 It wasn’t a good penalty, but it was enough to relegate Argentina to third place, in that moment.